Rex Miller joined us last week to present our September webinar, “Change Your Space, Change Your Culture: How Engaging Workspaces Lead to Transformation and Growth,” sponsored by Tandus Centiva. His new book, by the same name, was published last week and is available on Amazon. Check it out here. The book, available on Amazon. Rex Miller and a team of thirty-five companies have spent the past two years researching the effects that workspace has on company culture. 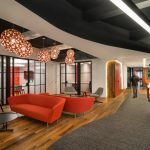 They called themselves the Case4Space, and their work has culminated in a new book, Change Your Space, Change Your Culture: How Engaging Workspaces Lead to Transformation and Work. During the webinar, Miller used comic book illustrations to identify some of the biggest problems that they found are affecting today’s workplaces, along with examples of what solid workplace cultures really look like. Full copies of the comic book are available in participating Haworth showrooms; highlights from the presentation are below. Ok, this is scary. So what does great workplace culture look like? 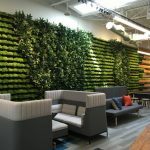 Miller said that some of the best change initiatives they witnessed where within companies recognized that a good bit disengagement in their workplace, and then used the built environment as a key part of their strategy for transforming them. “These are companies with engaging cultures born in this information age with an innate understanding of what working in a network world where information and talent and creativity is the primary medium of exchange,” said Miller. They instinctively know how to create environments that engage people to give their best. Examples include companies like Google, Zappos, and Carfax. Transforming a static legacy culture. “These companies saw that their culture wasn’t going to get them further,” said Miller. “Many companies are recognizing that the way we used to get things done — certain people entitled with big offices, [the hierarchy, in other words] — is getting in the way of us being collaborative and transparent. In the book, Miller includes three case studies of companies that transformed their culture using space as the primary catalyst. In the end, the best way to identify and then capitalize on your company’s culture is to identify what makes it stand out from the rest. Order your copy of Change Your Space, Change Your Culture here. Thanks to everybody who attended the webinar! Highlights from last week's change management webinar with Cheryl Duvall.